Get ready to paint the town red as the leading real estate company in the Philippines, SM Development Corporation (SMDC) teamed up with SM Supermalls to give away 10 fully- furnished condominium units to 10 lucky shoppers. Yes! You read it right! 10 lucky shoppers will get to experience star-life condo living with SM’s biggest and grandest promotion ‘Shop at SM Malls and Win an SMDC Condo’! Joining this exclusive promo is easy! 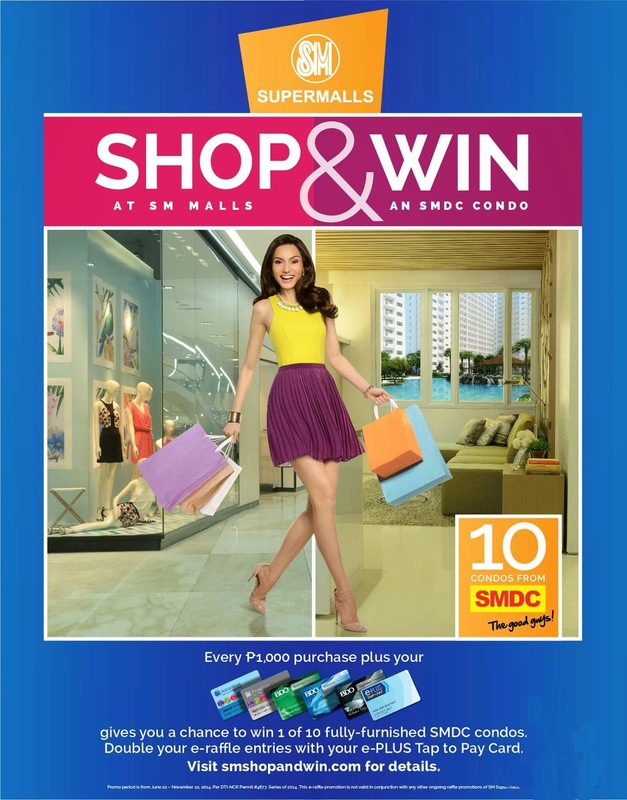 Shoppers need only to shop or dine for a minimum of P1,000 single or accumulated purchase in any of SM Supermalls’ 49 mall locations nationwide including SMDC Jazz and Sun Mall. By simply presenting your receipt/s along with your E-plus Loyalty card, SM Advantage Card, SM Prestige card or BDO Rewards card entitle shoppers to an e-raffle entry. Double your e-raffle entries by using your E-Plus loyalty card! A total of two (2) condo units from SMDC’s prime properties will be given away every month starting June till November 2014 in prime locations across Metro Manila. Promo runs from June 22 up to November 22, 2014. Visit www.smshopandwin.com for more details or like and follow SM Supermalls on facebook.com/smsupermalls and on Twitter and Instagram (@smsupermalls) for regular updates. So hurry! Don’t miss this amazing promo! Who knows you might be the lucky winner of a brand new SMDC Condo! Visit SM City Marilao and SM City Baliwag today and increase your chances of winning!